bSix12 – Do what makes you happy! » A Dime Can Make You Happy! 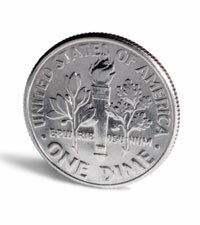 A Dime Can Make You Happy! What do you need to make your life look better? Will a dime do? In a classic study at a German university, Psychologist Norbert Schwarz in the course of a day occasionally placed a coin equivalent to a dime on a copy machine for the next user to find. Later, everyone who used the machine was interviewed about their lives. People who found the dime reported greater levels of overall satisfaction with their lives than those who didn’t find a dime. “It’s not the value of what you find,” Schwarz says. “It’s that something positive happened to you and surprised you”. Very minimal things can temporarily put you in a good mood. Every time something happens that is over your expectations will put you into a better mood. Often it’s the little things in life that make us happy. All you have to do to start your own Kindness Chain is to do something nice for someone else… that’s it! Encourage them to "pass it on" so the chain isn’t broken. What did surprise you recently? How did you surprise others in a positive way? You are invited to share your own stories in the comments below. The Starfish Story: Make a Difference!